In the late 1960s, before turning to Trotskyism, Mike Davis was an organizer with the Southern California Communist Party USA. A Michael Davis was listed as "an active member of SDS" and a member of the faculty of the far-left New Left School in Los Angeles California in a California Senate Report 1970. In 1992 Mike Davis, Central American solidarity activist, New York, endorsed the Committees of Correspondence national conference Conference on Perspectives for Democracy and Socialism in the 90s held at Berkeley California July 17-19. The West Coast Socialist Scholars Conference 1993, "New Realities, New Identities ; Socialism and Empowerment" was held April 17, 1993 University of California, Los Angeles. 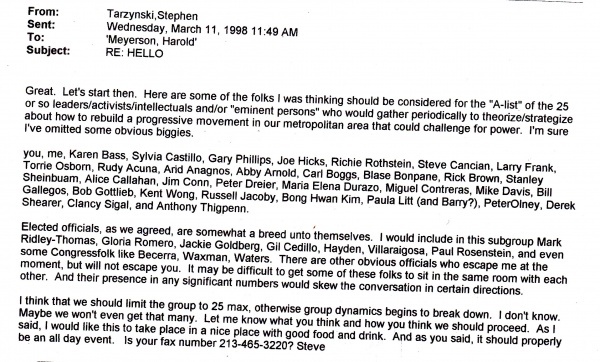 On March 11, 1998, Los Angeles Democratic Socialists of America leader Steve Tarzynski wrote an email to another Los Angeles DSA leader Harold Meyerson. Tarzynski listed 25 people he thought should be on an "A-list" of "25 or so leaders/activists/intellectuals and/or "eminent persons" who would gather periodically to theorize/strategize about how to rebuild a progressive movement in our metropolitan area that could challenge for power." Tarzynski listed himself, Harold Meyerson, Karen Bass, Sylvia Castillo, Gary Phillips, Joe Hicks, Richard Rothstein, Steve Cancian, Larry Frank, Torie Osborn, Rudy Acuna, Aris Anagnos, Abby Arnold, Carl Boggs, Blase Bonpane, Rick Brown, Stanley Sheinbaum, Alice Callahan, Jim Conn, Peter Dreier, Maria Elena Durazo, Miguel Contreras, Mike Davis, Bill Gallegos, Bob Gottlieb, Kent Wong, Russell Jacoby, Bong Hwan Kim, Paula Litt (and Barry Litt, with a question mark), Peter Olney, Derek Shearer, Clancy Sigal and Anthony Thigpenn. Included in a suggested elected officials sub-group were Mark Ridley-Thomas, Gloria Romero, Jackie Goldberg, Gil Cedillo, Tom Hayden, Antonio Villaraigosa, Paul Rosenstein and Congressmen Xavier Becerra, Henry Waxman and Maxine Waters. Tarzynski went on to write "I think we should limit the group to 25 max, otherwise group dynamics begins to break down....As i said, I would like this to take place in a nice place with good food and drink...it should properly be an all day event." In 2007 Mike Davis was listed on the DataCenter's annual report as a donor to the organization. The Oakland, California based DataCenter is widely regarded as the intelligence wing of the United States Left and has close ties to Cuba. On May 1 2008, Mike Davis, Author and Professor, University of California, Irvine signed an open letter to SEIU president Andy Stern in protest at SEIU move to force its local United Healthcare Workers into trusteeship. "We are writing to express our deep concern about SEIU's threatened trusteeship over its third largest local, United Healthcare Workers (UHW). We believe that there must always be room within organized labor for legitimate and principled dissent, if our movement is to survive and grow. Putting UHW under trusteeship would send a very troubling message and be viewed, by many, as a sign that internal democracy is not valued or tolerated within SEIU. In our view, this would have negative consequences for the workers directly affected, the SEIU itself, and the labor movement as a whole. We strongly urge you to avoid such a tragedy." In 2009 Mike Davis was listed as a Contributing editor of The Nation. In 2009 Mike Davis was listed as an endorser of the Center for Labor Renewal. In 2009 Mike Davis was listed as an advisory editor of Against the Current, bi-monthly analytical journal of U.S. Trotskyite organization Solidarity . New Labor Forum is published by Center for Labor, Community, and Policy Studies, Joseph S. Murphy Institute for Worker Education & Labor Studies. Editorial Board members listed, as of March 2013; were; Elaine Bernard, Ron Blackwell, Barbara Bowen, Kate Bronfenbrenner, Arthur Cheliotes, Mike Davis, Amy Dean, Steve Early, Hector Figueroa, Janice Fine, Bill Fletcher, Jr., Juan Gonzalez, Marie Gottschalk, Gerald Hudson, Lisa Jordan, Tom Juravich, Robin D G Kelley, Jose LaLuz, Nelson Lichtenstein, Manning Marable, Ruth Needleman, Ai-jen Poo, Katie Quan, Adolph Reed, Daisy Rooks, Andrew Ross, Kent Wong. This page was last modified on 12 August 2018, at 02:37.